My Munchable Musings: You're Invited! This time of year, the proportion of zucchini in my diet peaks, although lags slightly behind tomatoes and peaches. While I enjoy it simply prepared, roasted or sauteed, sometimes it is necessary to infuse a little something extra. 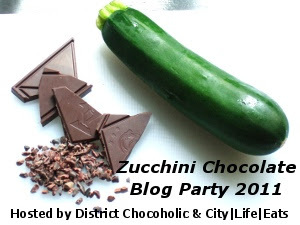 My fellow DC bloggers, Victoria of the District Chocoholic and Valerie of City|Life|Eats, have invited any interested blogger to participate in a Zucchini Chocolate Blog Party. Yes, you heard me right, a celebration of two spectacular edibles! Based on my track record, you can probably guess what I chose. My situation was complicated slightly due to the fact that I am residing at my parental units' home, but I managed to scrounge up a few ingredients and make use of the large patty-pan squash from Sunday's farmers market. Some leftover frozen cherry halves were icing on the cake. Enjoy! 1. Grate zucchini into a bowl. Add oil, sugars, extract, and cocoa powder, mixing until uniform. 2. Combine rest of the dry ingredients until it all comes together. For cookies, the dough should be pretty thick, so add more oat flour as needed. If you decide to make mini cakes, it can be a little more batter-like. 3. Use a tablespoon to scoop the dough onto a lined cookie sheet. Press a thumb into the center of the cookie, and the place a cherry half in the dent. 4. Bake at 350F for 20-25 minutes until outside of cookie set. Allow to cool before consuming... or, plop a scoop of vanilla soy ice cream on top and dig right in! I think this is one of those "bake your cake and eat it too" moments. Oh I love it - zucchini, chocolate, AND cherries. Yes! Yum. This looks fantastic!! Thank you for submitting this recipe to the Zucchini Chocolate Party!